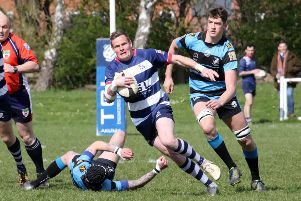 Banbury Bulls made it five Wadworth 6X South West One East wins on the spin as they comfortably beat Wimborne 57-14. It was expected to be a close affair between two sides locked together in the table but Saturday’s game at the DCS Stadium was over as a contest at the halfway point with Bulls 27-7 to the good. Skipper Ian Isham and the outstanding Ed Berridge each bagged a brace of tries as Bulls dominated from start to finish. Bulls went ahead when Sam Stoop intercepted a loose pass and raced clear before off-loading to Sam Mills who, with the line beckoning, hesitated at the last minute and was held up. The opportunity looked to have been lost but Isham gathered and forced his way over and Ed Phillips added the conversion. Bulls increased their lead when the ball was switched along the line to Tom Burman who was stopped in the corner but he managed to find Phillips who passed inside to Stoop who went over. Bulls went further ahead when Duncan Leese chased a long kick from Joe Mills down the line, gathered and went over in the corner. Moments later, Bulls put themselves into a strong position. Burman carved out the opening for Berridge to race clear and ground behind the posts, setting up a comfortable conversion for Phillips. Wimborne got their first points on the board when Josh Booth intercepted a loose pass on halfway before racing clear to score and Lewis Munster added the extras. But Bulls had the final word before halftime when a sweeping move ended with replacement Morgan Bowen slipping a neat reverse pass to Burman who went over in the corner. Jack Briggs got in on the act when he crossed in the corner following a period of sustained pressure from Bulls and Phillips added the extras. Wimborne were unable to offer a serious threat in the second half and they rarely got into the Banbury half. Isham bagged his second try when he raced on to a perfect pass from Berridge to break through the Wimborne line and Phillips added the conversion. The impressive Berridge broke through to cap a fine display with his second try of the match as Bulls reached the 50-point mark. Joe Mills rounded things off for Bulls when he raced on to Berridge’s pass to score in the corner and Phillips kicked a superb conversion. Wimborne scored a consolation try deep into stoppage-time through Duncan Foley and Munster added the extras.